NECRONOMIDOL’s Strange Aeons is available in two physical CD versions — Ver. DIRGE and Ver. PAEAN. Both are presented in deluxe 6-panel matte digipack packaging with artwork by manga artist Waita Uziga and photography by Dan Szpara. 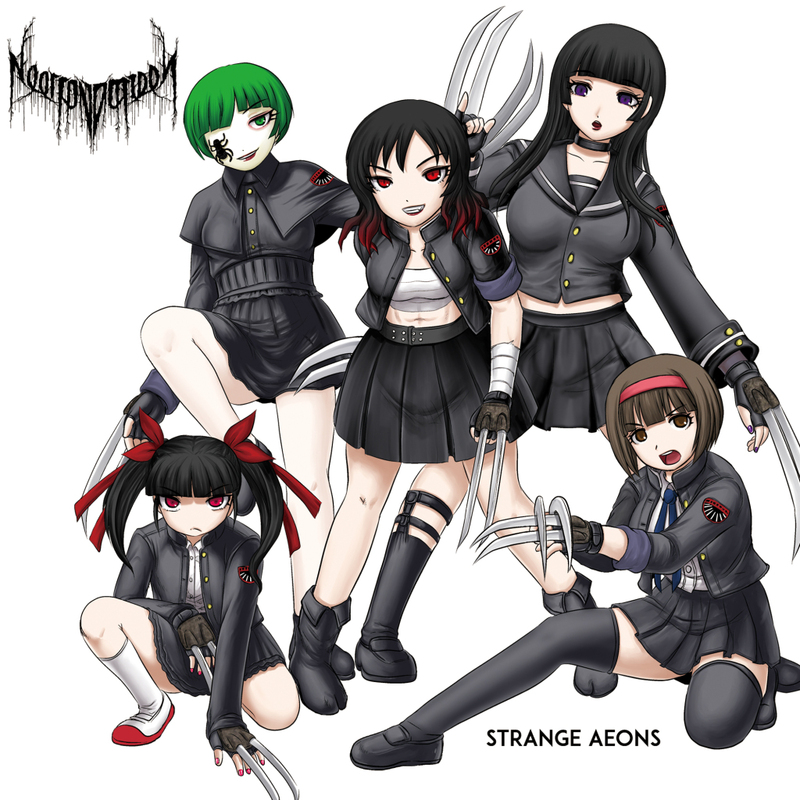 “STRANGE AEONS” is a collaboration with the band Kiba of Akiba (who have previously collaborated with BABYMETAL and provided the opening theme song for the anime “No Matter How I Look at It, It’s You Guys’ Fault I’m Not Popular!”) and is the first time the band has collectively collaborated with another group on a song. The other songs feature several new songwriters (Takeru on “dirge of baldr” and Zero-2 of the Osaka punk band Poikkeus on “WITCHING HOUR”) as well as long-time collaborator Azusa Iwanaga (ITHAQUA, LAMINA MALEDICTUM) on “BLOODWINGS”. This one should not be too new to fans of the group. There are a few videos on YouTube of this tune, just go take a look. I hate to say anything about NECRONOMIDOL is commercial, but if forced to, I would have to say this is probably the most commercial track on the single. You can certainly hear the Kiba of Akiba style in the song. Not 100% the Necroma that I love (more like 97%) but I most assuredly wouldn’t turn it off — it’s a really good track. For me this is the stand-out track on this single. It starts out with a tiny bit of creepy elements then goes right into a jaunty little riff. After that the vocals start, and they’re excellent. It seems that every NECRONOMIDOL release gets better vocally. Anyhow, the vocal layering on the track is excellent. All the girl’s voices blend together so well here, the effect is really quite amazing. If there was anything on this release anywhere remotely near to a classic Necroma darkwave track, this is it. Unfortunately, I feel that it misses the mark slightly and sounds a bit too bright compared to the other songs. The synth is good but the tempo is a bit more like a club track, with a great mini-breakdown every now and then. I can see what they were trying to do here, but I think they were slightly off-target. The saving grace of this track is the vocals, at times subdued and at other times soaring and epic. I think it could have done with just a tiny bit more of the dirge. This track comes right out of the gate firing on all cylinders, sort of bringing me back to the earlier 90s of metal. A good quick pace, catchy riff, snappy drum beat. This one just kind of reaches out and grabs you. You can tell this was written by Azusa Iwanaga, it has his signature all over it. I really can’t tell you how much I enjoyed this track. Visit NECRONOMIDOL’s Bandcamp page for more info. Originally posted at Straight From Japan!